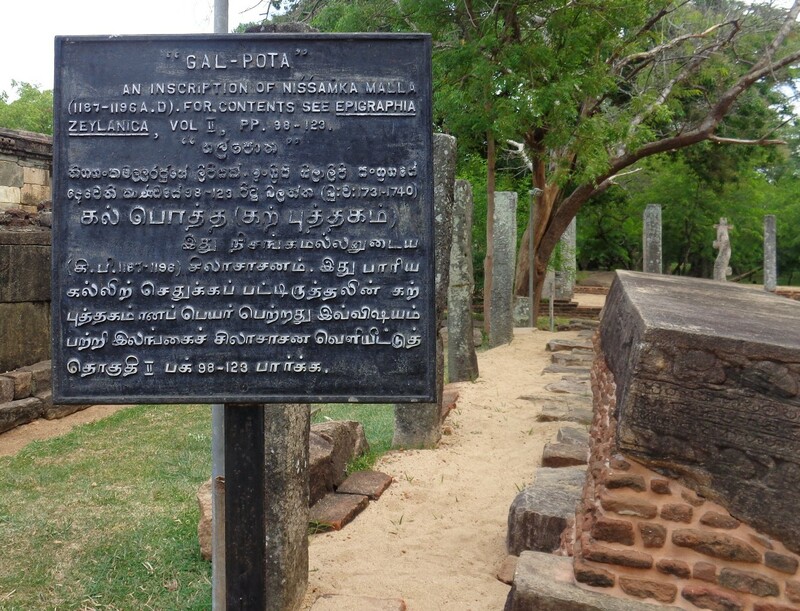 Gal Potha (Stone Book) is a giant stone inscription located in the Dalada Maluwa premises of main archaeological site in Polonnaruwa District, Sri Lanka. 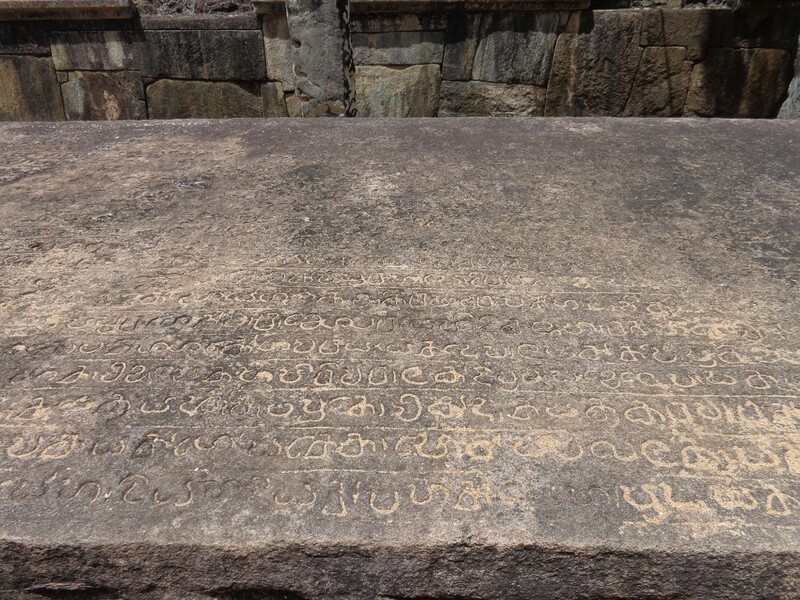 It is a work of King Nissankamalla (1187-1196) and it is the largest stone inscription discovered so far. 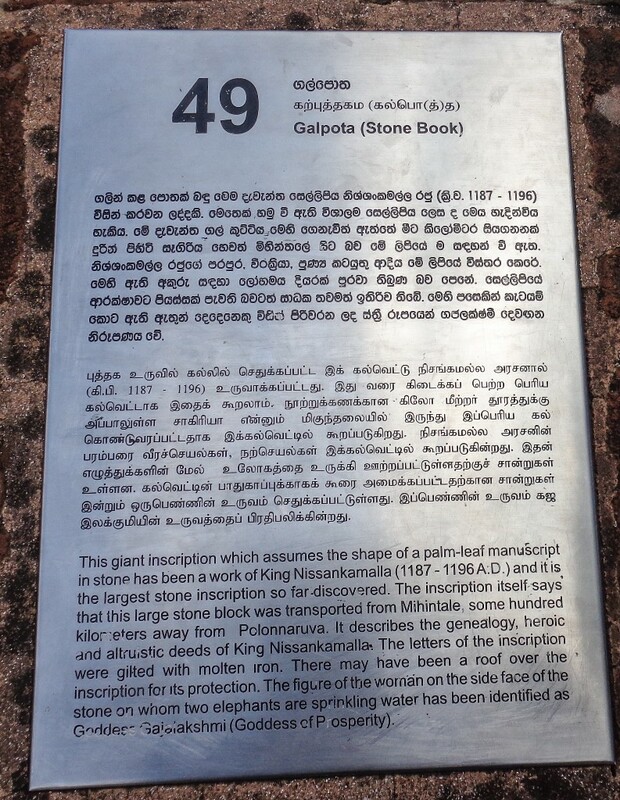 The inscription itself tells that this large stone was transported from Minintale, some hundred kilometers away from Polonnaruwa. It describes the genealogy, heroic and altruistic deed of King Nissankamalla. The letters of the inscription were embossed with molten iron. The figure of the woman on the side face of the stone on whom two elephants are sprinkling water has been identified as Goddess Gajalakshmi (Goddess of Prosperity). 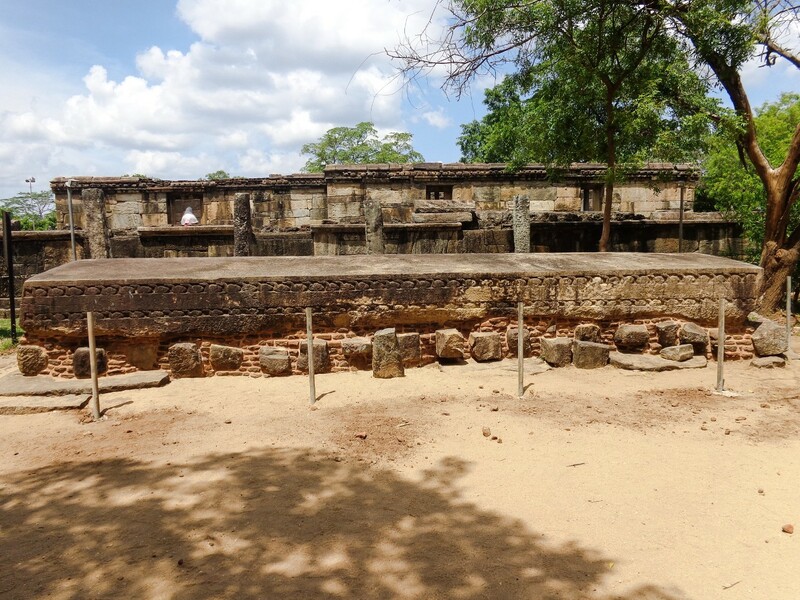 Hatadage is an ancient shrine in the Polonnaruwa District of North Central Province, Sri Lanka. It was built by the King Nissanka Malla (1187-1196 A.D.). This had been used to place the sacred tooth relic of Lord Buddha. According to historical sources, the shrine has built in sixty hours. The English translation of the Sinhalese word “Hata” is sixty, represent the duration of the construction period and the word “Dage” has the meaning of “relic shrine”. The remaining features of the building for today, evidence that the shrine was originally a two-story building. The shrine is 120 ft in length and 60 ft in width. Sathmahal Prasadaya is a unique type of 7 storied ancient building in Dalada Maluwa premises in Polonnaruwa District of North Central Province, Sri Lanka. The Sinhala name “Sathmahal” has the meaning of 7 storied. The building is completely built with bricks and it takes the shape of a pyramid. The base of the building is the shape of a square with side length of 35 ft. There are four doors with arches on each side. 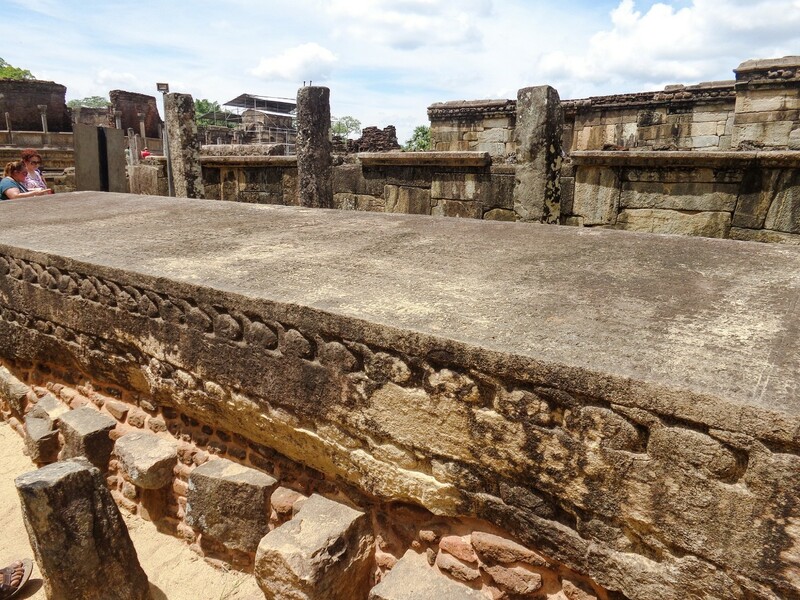 Since these type of buildings have been found in Northern Thailand, this is also considered as a monument which confirms the foreign affairs in ancient Sri Lanka. 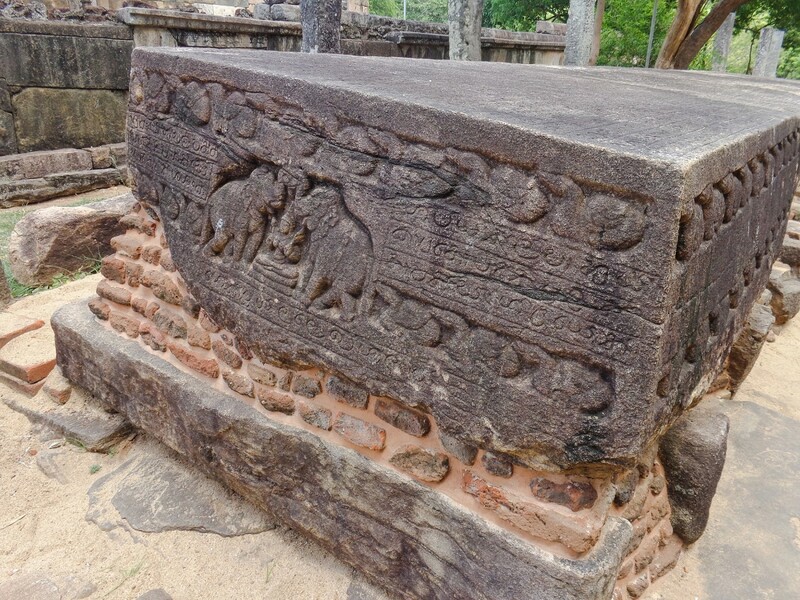 According to the inscriptions found, this pillared structure has identified as the Nissanka Latha Mandapaya. It is located in the place known as Dalada Maluwa in Polonnaruwa District of North Central Province, Sri Lanka. This building was constructed by the King Nissankamalla (1187-1196 A.D.). According to an inscription, this is the place where the King Nissankamalla listened to Pirith Chanting (a recitation or chanting of the word of the Lord Buddha). The building is surrounded by a stone railing and the entrance is also protected by a stone doorway. The stone pillars in this building are a unique design. These pillars are not straight and they are carved in three places. The top of the pillars takes the shape of a lotus bud. And the rest of the pillars have carved as the stem of the flower. 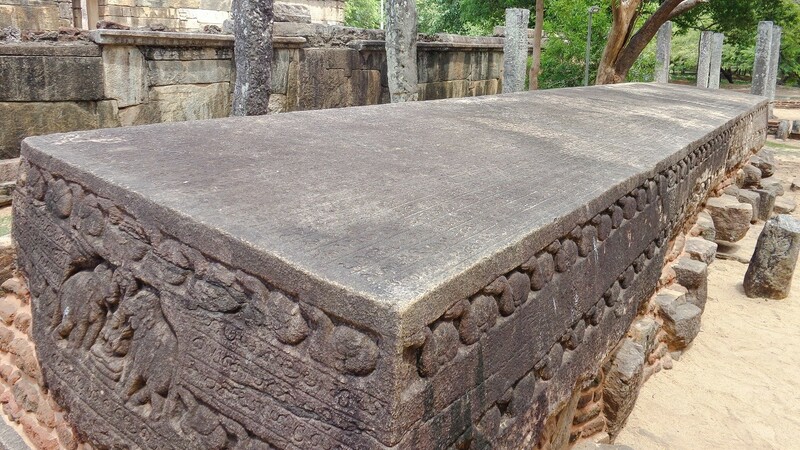 There is a small stone Stupa (truncated top, perhaps to receive the relic casket during Pirith chanting) on the center of the platform in the middle of the building. It is believed that the roof of the building was done with wood. Polonnaruwa Vatadage belongs to the Polonnaruwa Kingdom. It is a structure which is built encircling the stupa for protection. It is believed that the structure was built during the reign of King Parakramabahu I (1123–1186) to hold the Sacred Tooth Relic of Lord Buddha. However, this has been renovated during the reign of King Nissanka Malla (1187 – 1196). One of the four Buddha statues on the upper platform This is the most famous Vatadage among the other Vatadage structures found in Sri Lanka. It has two stone platforms and only single entrance is there to access the lower platform. There is four entrance to the upper platform facing four cardinal points and four Buddha statues are located facing to each entrance. The stupa is placed at the center of the upper floor in between the Buddha statues. Two Guard stones ( Muragala) and a Moonstone (the Sandakada Pahana) are located at the beginning of staircases. Compared to the Moonstones carved in Anuradhapura period, the symbol of bull is missing in these moonstones. 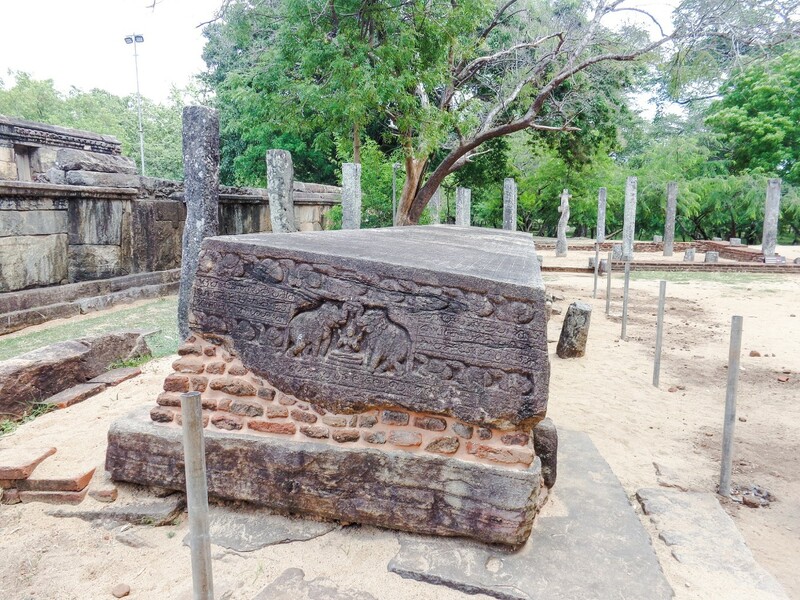 Historians believe that the removal of bull from Moonstone in Polonnaruwa period occurred due to the influence of South Indian customs and traditions during this period.